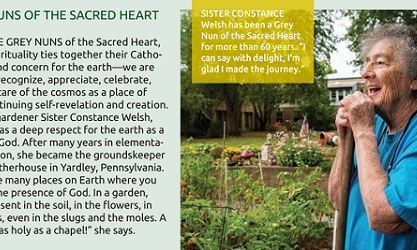 Sr. Constance Marie Welsh was featured in Vision Magazine 2017. Vision is a publication of the National Religious Vocation Conference which offers vocational discernment support to thousands of adult Catholics every year. The full article titled “Vocation takes cultivation” highlighted a variety of communities and their gardens and gardeners. Like vocations to religious life, they come in all shapes and sizes. Some are well planned, and some are more organic. Some have been a long, slow process and some sprung up from a need. Our own ‘gardener’ has since left her job behind as her health began to fail and our Motherhouse was closed down. But, the heart of a gardener still beats in Sr. Connie’s life. She is planting new memories and friends at Holy Redeemer Lafayette. There is little that can truly keep this earth-girl down. Thank you, Sr. Connie, for sharing your life and your love of God’s creation with us! What happened to the Motherhouse at Yardley? And where did all the nuns go? Do you not have a motherhouse anylonger? Is the school still there? Thank you for your concern, Fran. Details of the sale of the Motherhouse and movement of our Sisters has been provided on other blog posts within our website. There are stories, and pictures and letters from Leadership. We have also been providing updates from the Sisters who have moved. We hope you will read these other postings! thank you for your concern. By the way,Grey Nun Academy is still where it has always been, and they are getting ready to welcome the students back to school!